We discovered early on we could make art that was also eco-friendly. Making art on found objects resulted in saving vinyl records from the landfill, while having an affordable canvas that is fun and looks cool on any wall. Rick Sans and Serganddestroy have been exhibiting art as a duo since 2007. They originally started doing art by screen-printing tee shirts as one off pieces of wearable art in 2005. This lead to further exploration of mediums and media by creating art on found objects. 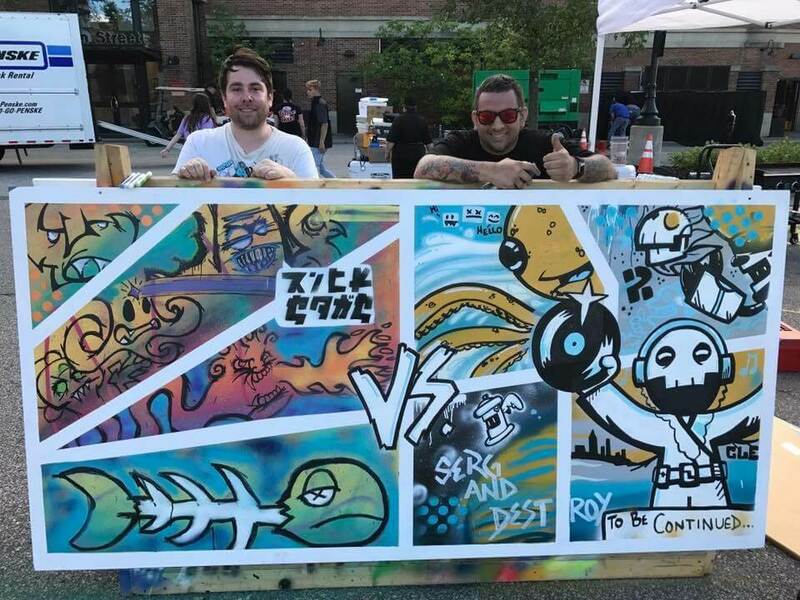 Doing art on vinyl records has been a mainstay of the duo’s collaborative effort since nearly the beginning. This has lead to exhibiting the vinyl art in many different places in the world. Collectors range from fellow residents in their home town of Cleveland, Ohio to world famous Hollywood actors and DJs. Each year they continue to take on new events and additional projects. Stop by an upcoming event and check out what we have made lately.